Happy Thanksgiving! I have so much to be grateful for this year. In case you missed it, we welcomed our beautiful baby girl into the world [which is why I’ve been a little bit MIA from the blog the past few weeks!] It’s Kennedy’s first Thanksgiving and we couldn’t be more excited to be celebrating with our little family and extended family. I wanted to share some Thanksgiving outfit ideas + if you’re doing any Black Friday shopping, these are all great options! 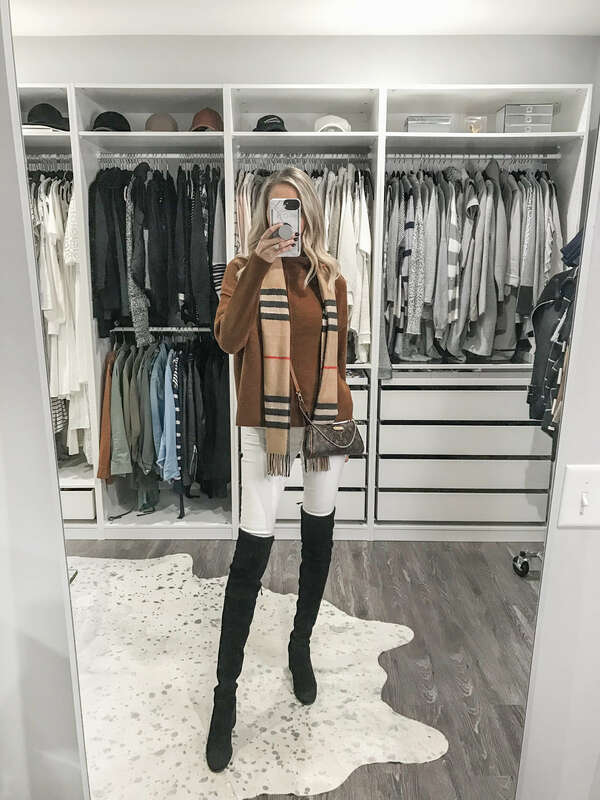 I love mixing high and low price points with my outfits- I invest in accessories that I’ll rewear every year [the scarf and boots] and then I’ll add new pieces like this sweater I found at Target for only $27! There are so many great sales this weekend, making it the perfect time to snag both investment pieces [my boots never go on sale, but they are 30% off in the Shopbop sale right now] and new on trend pieces you can wear throughout the winter. I’ve linked to a few of my favorite sweaters below, including one with a shoulder cut out I have in my cart right now!